VinFast presented the LUX SA2.0 crossover (shown) at the Paris auto show last week alongside the LUX A2.0 sedan. HANOI, Vietnam -- VinFast, which aims to become Vietnam's first domestic automaker, said it has secured a 12-year credit facility for as much as $950 million to help buy machinery and equipment from German suppliers. 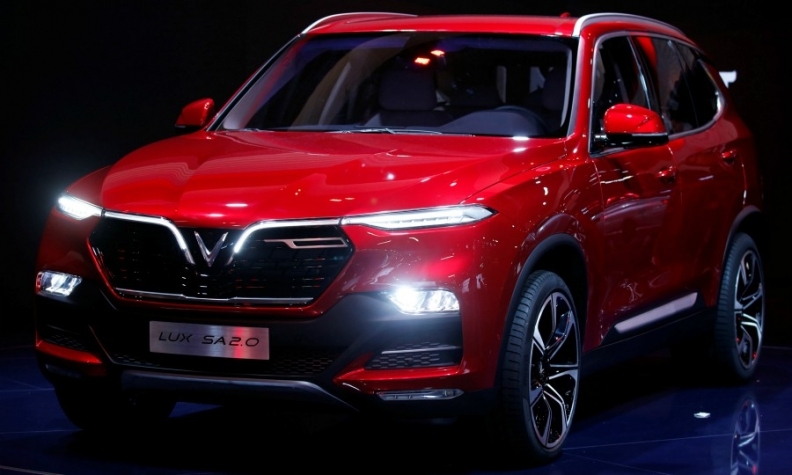 The company, a unit of Vietnam's largest conglomerate Vingroup JSC, plans to have its first production models built under its own badge hit the streets next August. Vingroup has earmarked about $3.5 billion for the project. VinFast, led by former General Motors executive Jim DeLuca, showed off its BMW-based LUX A2.0 sedan and LUX SA2.0 crossover at the Paris auto show last week. Assembly is scheduled to begin next year. Credit Suisse and HSBC were the lead arrangers and the financing agreement was guaranteed by German export credit agency Euler Hermes, Vingroup and Vinfast said in a statement.